If you are experiencing “deja vu” every time you enter a jewelry store or website these days, you really need to visit one of the Twin Cities best kept secrets when it comes to truly original engagement, wedding and anniversary ring designs. For the past 20 years, Brian Walters has been crafting some of the most unique pieces out of his low-key Lake Minnetonka location. To add to his many design awards, the Lake Minnetonka area recently voted Brian’s shop “Best of” in the fine jewelry accessory category. 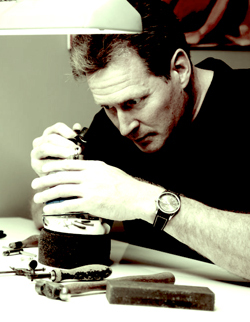 For those who are unsure about their fine jewelry “identity” or who are just starting their own personal collection, Brian considers himself to be a “Jewelry Psychologist” of sorts, and is available for free consultations. Brian feels that he can tell you exactly what metal color and gemstones are best for you, and what sizes and shapes of jewelry would best grace your eyes, facial features, neck, hands and wrists. Close your eyes and imagine your perfect ring. What would it look like? How would it feel to wear? Hold that thought and contact award-winning designer Brian Walters. He will invite you into his workshop and listen to your thoughts and ideas, and then create a selection of designs for you to chose from. Platinum and white gold seem to be popular right now, but did you know that Brian can create pieces in: Red gold, pink gold, rose gold, peach gold, Rolex gold, yellow gold and green gold? Some of Brian’s two-tone designs are really spectacular when flanked with the appropriate colored diamonds or gemstones. The shop is located in historic Excelsior on beautiful Lake Minnetonka. With all of it’s scenery, things to do and inviting small town atmosphere, Excelsior really is THE PLACE to “Pop the Question!” Engaged couples are often treated to dinner in Excelsior just for visiting Brian’s shop on Water Street. Basically, whatever the clients wants. If you want Brian to deliver your ring in tux and limo for an unforgettable presentation, Brian can do that; if you want Brian to make a photo diary of the entire ring making process, he offers that; if you prefer that Brian comes to your home or office to discuss designs and show you samples, he is more than happy to; if you want to watch as Brian sets your cherished family heirloom diamond into one of his new designs, he has a seat at his workbench waiting for you. You name it, Brian does it, with style! Repair, resetting and appraisals too of coarse. “Brides are fun to work with. With the many future wedding anniversaries and other special occasions that we hope to help them with too, we treat brides and grooms extra special. We want to be considered their personal jeweler for life! DO YOU DESIGN YOUR OWN JEWELRY? IF SO, CAN A COUPLE COME IN AND DESIGN A RING WITH YOU? Yes, and by all means, yes! Many years ago, I worked behind the scenes and did the custom work for many stores in the Twin Cities area. When I was about 25 years old, a major national jewelry manufacturer that I had been working for copied some of my designs and put them into their line. That’s when I decided to open a shop and go out on my own. I entered some local and regional design contests and then I was juried into the Mpls. ACC show (American Craft Expo) on my very first try. Ever since then, couples, both married and engaged, have been coming in and coming back, year after year. I just made the engagement ring for the daughter of one of my very first engagement ring clients from when I was still working out of my home! DO YOU CARRY HIGH-END JEWELRY AND COSTUME JEWELRY? Since I design and make my own jewelry, and try not to repeat a design, I do not have to stock a lot of finished pieces. I regularly make pieces to exhibit at shows or enter in design contests. Occasionally I will dream up something that I just have to have photographed on a model, or I will get an idea for a collection that I want to test market. My designs start around $1000 (at current gold prices), many folks do not consider that to be “high-end.” If you are looking for lower priced but nice jewelry for gifts and other occasions, we do carry some very cool earrings and pendants starting at $20. We also have a wedding party gift catalog that my engagement ring clients are welcome to check out and order from, for everything from: cuff-links to money clips, and pearl bracelets to genuine gold dipped roses, and flatware to music boxes and pen sets. HOW LONG DOES IT TYPICALLY TAKE FROM THE TIME YOU ORDER A RING OR PIECE OF JEWELRY TO THE TIME IT IS READY TO GO? Sometimes ideas start coming to mind while I’m meeting with the clients, other times it takes a few days or maybe a week before I’m in the right creative mood. I get a lot of good design ideas late at night and I keep a sketch pad by my bed-side. The actual ring-making time depends on how detailed and complex the design is going to be, plus I have to allow time to source and hand-pick the materials (gemstones, diamonds, alternative stones, special alloys and precious metals), but usually delivery time is 3-4 weeks. There has been a few times when I have worked almost around the clock to create a piece on short notice within a few days. Most clients tell me not to rush it, and they usually trust my guidance on design details. More than a few clients have not been able to decide between two of my designs and have let me surprise them with the one that I think is really right for them. Sometimes the groom-to-be will present the center stone in a temporary setting and bring in his new fiance’ to have a part in the design process at a later time. Yes. There is hand engraving, lazer engraving and machine engraving. All are available. People are my inspiration! Meeting with people at the most happy time in their lives, seeing the love, hope, potential and promise in every person and then the glow of appreciation on their faces when they see what I have created for them, this is what has kept me going for over 25 years now. I love nature, the ocean and being outdoors, but my best designs are still inspired by people. My guarantee is simple: if you do not love your design, I want to change it, period. Brian will create a design that stays within your budget, or if you prefer, he can create a piece that goes way over budget (haha). Either way, he has the experience and expertise to make all of your dreams come true. He has received national acclaim, winning five awards from JCK (Jewelers Circular Keystone) Magazine, host of one of the worlds largest annual jewelry shows. His creations have found their way onto the red carpet of the Emmy Awards, the Leno show and on Miss USA. Something magical seems to happen when Brian sits down at his drawing board. Who knows whether YOU will inspire his next award-winning creation! Why compromise on something you will wear forever? A final note to would-be copycats and knock-offs: We really appreciate the compliment but care to remind you that all designs on this webpage and our other websites are copyright protected, and duplication or reproduction of any images or jewelry is strictly prohibited by U.S. and International copyright laws. Dealer/retailer inquires are welcome.